Well, you know I like nothing better than when our author, Terrie Farley Moran comes to town because she always finds time to talk about the Read ’Em and Eat Café and Bookstore on glorious Fort Myers Beach, so Bridgy and I get a lot of customers coming in for a glass of sweet tea and a piece of Aunt Ophie’s Buttermilk Pie. 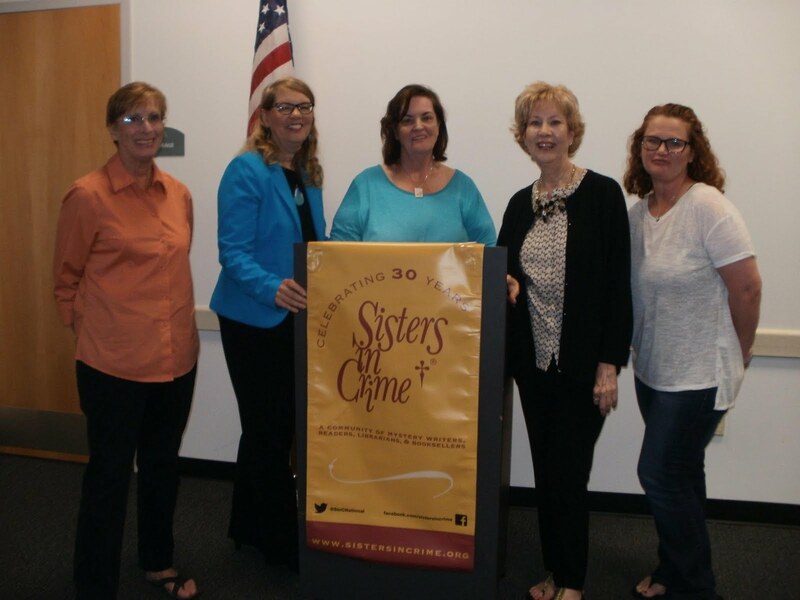 Just last month Terrie visited a dynamic group of writers at the Florida Gulf Coast chapter of Sister in Crime. 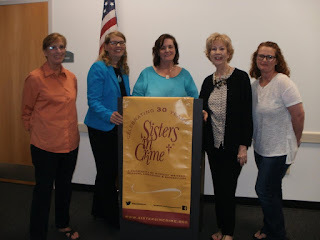 (And yes that is Killer Characters author Cheryl Hollon next to Terrie. Visit her characters here on the 24th of every month.) While I do wish Terrie had spent a little more time talking about us and a little less time talking about her grandchildren, (honestly, I don’t think she can help herself) Bridgy and I listened in and there was a lot of give and take about writing and reading and characters. Well, I can tell you that I love to hear writers talking about characters. After all—we are the ones that make the story come alive, are we not? So to celebrate this hugely fun visit, we are giving away notepaper with designs that are soooo Gulf Coast. They are from a collection by famous artist Leoma Lovegrove of Matlache. Do you remember when Bridgy and I took the moms there for a visit? To enter please comment below and tell us anything at all about writing notes. You love to, you hate to, you draw funny pictures—we want to know. Please include your email in this format: yourname (at) your server(dot) com—so the spambots can’t pick it up. Comments close at midnight on Sunday May 21st. I do enjoy taking notes but I also doodle on them. I love to dodle when at conferences- I do take notes but with doodles on the side or top of paper. I have always loved to take notes. Often pages & pages of notes. Occasional doodles, but mostly words. :). And, I always keep my notes! My friends joke that I am single handedly keeping the USPO in business. Notes go way beyond the obligatory birthday cards, in fact, I send crosswords to my best friend's 88 year old mother weekly, and then notes to her freshman daughter (I was her elementary school pen pal) every two weeks. Even though I love the quick connect of a text, there's something so wonderful about penning words to the people you really love. I don't like taking notes---so I just listen and write down references I might need. I love taking notes when I'm reviewing books or doing a bible study. Thanks for the chsnce. I love to receive hand written notes and also to send them. It has become a lost art. I write notes to myself all the time, usually on post it notes, so I remember to do something or pick up something at the store. I'm artistically challenged, so I don't usually doodle. While on our honeymoon, some 25 years ago this June 13, I purchased lots of notecards and stationary from shops in Paris and London. I still have a few left and have enjoyed using them all these years, when writing notes to friends and relatives. I love to use different colored pens. What fun ! I journal regularly & would love to incorporate the notepaper. The gulf coast inspired notepaper is gorgeous!!!! I write myself reminder notes all the time but mostly I write thank you notes to my kids at school for their sweet gifts at Christmas, teacher appreciation week, etc. I like writing notes especially when there are lists of books involved. I grew up writing thank u notes and letters to my grandmothers. It's natural for me to write a short letter on paper and put it in a birthday card. I have collected a few old post cards. Love to see what people used to write on them and wonder if any of my notes or cards will be saved for that long. I doubt it though. I love taking notes with a multicolored ink pen based upon the "Dendrite theory" which color coding helps the brain learn and create new dendrites connecting synapses. It is in which the synapses formed, one learns new skills. I was a notetaker in college for deaf students. tokerblom1 @ gmail dot com. I'm a note taker.And I love to doodle will making a list of to-do stuff that naturally never gets done! I am a note writer but I don't usually doodle. Just jot 'em down and get 'er done! I'm not good at notes. I can listen or takes notes, I can't do both. (And, I know you have to listen to take notes but, I don't retain it if I am taking the notes). Giveaway is closed. Winner has been notified. Thanks to all for participating. And the winner is Susan Slovinsky--her package is on its way.